Mountain Chalet for Sale. Murphy, Cherokee County NC. 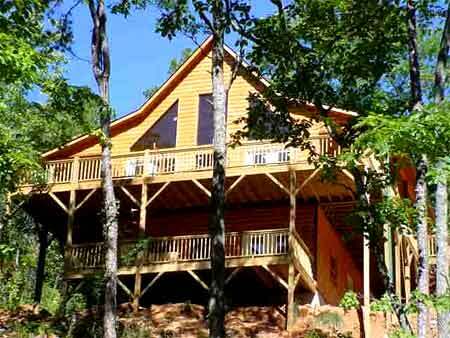 Murphy, Cherokee County NC homes for sale. Murphy, Cherokee County NC real estate for sale. North Carolina Mountain MLS realtor real estate listings. Mountain view houses, chalets, cabins on Lake Chatuge, Lake Nottely and Lake Blue Ridge, waterfront homes, lake homes, creek and trout stream homes, river homes for sale. Gated community development town homes and vacation rental homes for sale joins, adjoining, close to USFS, US Forest Service land. 154313 BEAUTIFUL CHALET WITH MANY UNIQUES EXTRAS. New 2 Bedroom,2 Bath Chalet with Full Unfinished Basement Plumbed for Extra Bath. Maple Hardwood Floors Throughout. Kitchen has Corian Countertops, Custom Maple Cabinets, and Stainless Steel Appliances. Stacked Stone Fireplace in Great Room. $224,750.